Many people suffer with excessive teeth grinding or bruxism. This may be an unconscious action during the day, but is usually a problem that occurs at night while sleeping. Teeth grinding damages enamel, wears down teeth, causes jaw pain, and irritates the gums. Also, your spouse or loved one may be disturbed at night by the sound of the grinding. One solution to nightly teeth grinding is a night guard, a form of orthodontics. 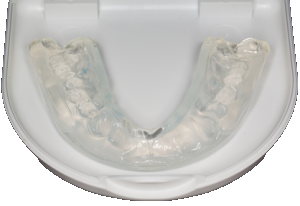 A night guard is similar the an athletic mouth guard, and creates a barrier between your upper and lower teeth while you sleep. The mouth guard will be custom fitted for comfort and proper breathing. A night guard is created after an impression is taken of your teeth, which is then sent to a dental lab. Night guards last a very long time and are very durable. There are also some tips you can utilize to try an prevent teeth grinding. Learn to relax and unclench your jaw during the day. Avoid chewing gum or nibbling on hard objects. Avoid drinking alcohol and caffeine, as they increase the chance you will begin to grind your teeth. If you are grinding your teeth at night, and need help schedule an appointment with a dentist right away. TMJ is short for the temporomandibular joint, which is the joint that keeps your lower jaw attached to your skull. This joint is responsible for jaw functions like chewing. If chewing or moving your mouth causes you pain, you may have a developed a temporomandibular joint disorder (TMD). TMD issues are usually caused by stress, clenching the jaw muscles frequently, or teeth grinding. Pain when closing or opening your mouth. Jaw frequently becomes stuck shut or open. Frequent headaches or ear pain. A clicking or popping sound when you open your mouth. As these symptoms may also be associated with other health issues, its’ a good idea to visit a medical professional if you are experiencing them. Teeth grinding can be especially annoying as it leads to other dental issues. Continued teeth grinding causes wear of the tooth enamel and can expose the dentin. Dentin is very soft and quite susceptible to decay. Which is why it’s important to maintain regular check-ups with your dentist. You may also experience sensitivity to hot and cold drinks as a result of grinding your teeth at night. If you believe you have developed TMD – see your dentist for a consultation. A dental professional can diagnose the problem and prescribe a solution. Hot/cold compresses and pain relievers can offer some short term relief for dental pain. A night guard may also be recommended to help stop teeth grinding while sleeping. This can train you to stop teeth grinding all together. For those suffering severe cases of TMD, surgery may be advised, but simple behavioral treatment with specialized jaw exercise and training will usually provide relief from painful symptoms. For help with any dental issue, you can always give our office a call at 719-596-0212 or click HERE to contact us or click HERE to make an online appointment. We’re always available to help you!